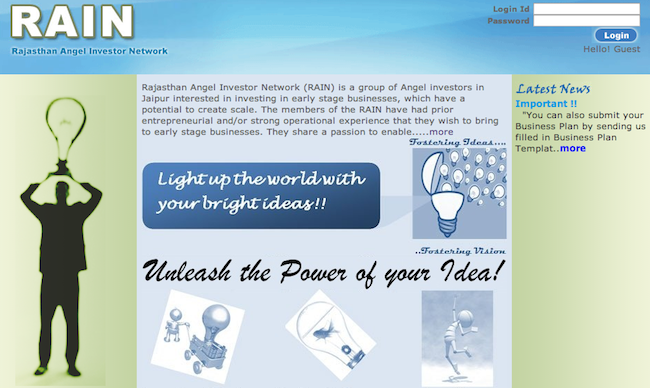 Rajasthan Angel Investor Network, or RAIN, as they like to call themselves, is the latest entrant in the angel investing space in India. Based in the pink city Jaipur, RAIN is a group of angel investors that are looking to invest in, mentor, and promote startups in the region. As of now, the group consists of 23 members that include Mahavir Pratap Sharma (also president of RAIN), founder and CEO, Oscar Exports and charter member of TiE Rajasthan; Manuj Goyal, MD, Pinkcity Colorstones; Rajesh Moondra, founder and CEO, Truworth; and Om Prakash Choudhary, founder, Opalsoft, Inc. Started in April this year, RAIN has already made its first investment of 2013. It had invested Rs 30 lakh ($49,370) in Organicshop.in, an online marketplace for organic products early this week. Of the 24 RAIN members, 13 had invested in the startup for 30 per cent equity and the deal saw Organicshop's valuation at Rs 1 crore. As part of the investment, Sharma had joined the board of the startup. "We started RAIN because such a network was missing in the region and ideation-stage as well as new startups were struggling due to lack of capital. The members of RAIN have had prior entrepreneurial and/or operational experience that they will bring to these early stage businesses, since apart from funding, the startups also require close mentoring and inputs on strategy, execution, as well as exposure to the industry," said Sharma. "In line with this philosophy, the group members will also commit their time and expertise to investee companies," he added. The angel network is now looking to invest over Rs 4.6 crore in around 15 startups by 2014 end. It will invest in early stage businesses across sectors like mobile, consumer internet (except e-commerce since the group feels it has already attracted too much interest), IT and apps that have a potential to create scale and can invest anywhere from under Rs 10 lakh (for an ideation stage startup) to Rs 2 crore in a company. Apart from funding, RAIN will offer an incubation centre, which is based in Jaipur, to the startups. While Rajasthan-based startups will definitely be given first preference, the group won't invest in them exclusively. "We are currently talking to one startup each in Bangalore, Delhi and Germany," stated Sharma. RAIN is also open to partnering with other individual angel investors and groups (like IAN), but it would prefer to lead the investment. There are already a number of region-specific (not region-focused) angel networks in the country, which includes Mumbai Angels, Kutchi Angel Network, and TiE Kerala's Kochi-based seed fund.